I have to admit this project has spiralled slightly out of control. You know how it goes, one idea leads to another, and before you know it you're designing a mini-textile range! 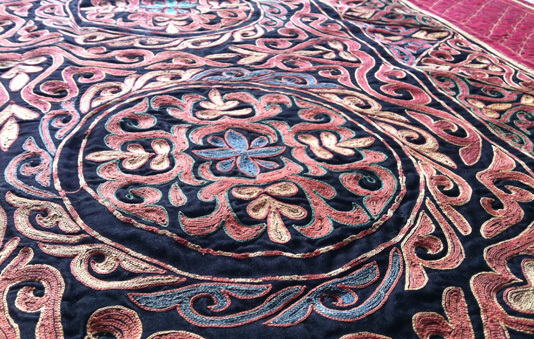 I started with the three motifs I originally designed for stitching then, of course, I found myself going back through travel diaries, museum books on Mongolian arts and crafts and revisiting some of the textile pieces I have stashed away. I couldn't quite find everything, partly because I'm still unpacking boxes (ridiculous, I know! ), but also because I think a couple of the jackets are at Mum's in storage. 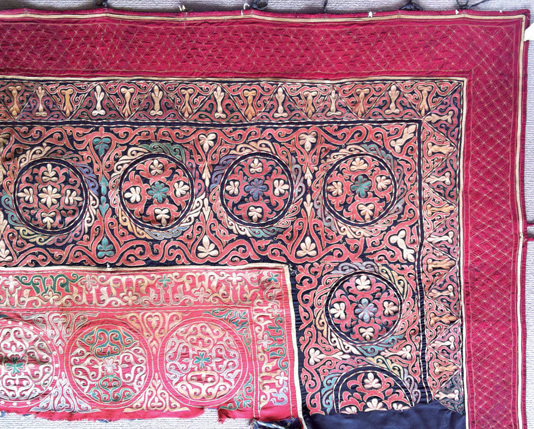 I did find the old, embroidered wall-hanging that would have been used inside a nomadic ger (yurt). Along the top of the hanging you can see the ties used to attach it to the tent frame, the bottom though, is left unfinished as this would have been resting on the floor. Along with being highly decorative, these hangings also provide good insulation for the ger walls. Half of my prized Mongolian wall-hanging. Between the embroidered hangings, saddles, boots and clothing, as well as the painted furniture, ger doors and temples, you can see there was a lot to be inspired by! I've added some more pics to the Pinterest board here, including one of a ger interior showing how the embroidered textiles are hung. 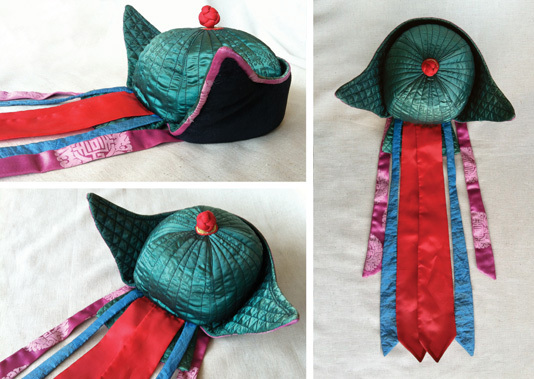 Mongolian hat in my collection. But back to my project! I'd decided that a stripe would go best with the stitched motif, since the stripes would form the sides of the pouffe and the stitched motif would be on the top. 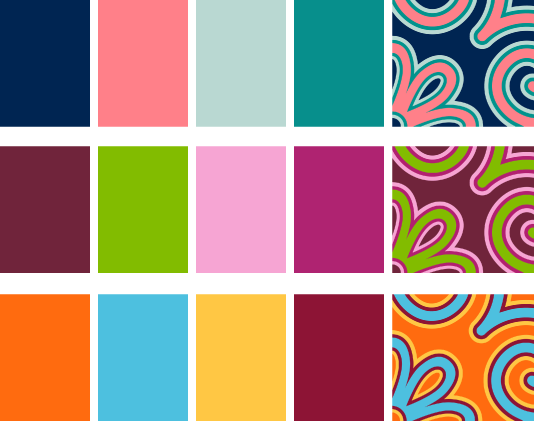 Once I started playing around with the patterns and colours again though, I thought I might as well go further. If I was going to bother designing one fabric, I might as well do a set. I also decided that while I needed to stick to the original colourways for the pouffe project, the other fabrics could be in more contemporary colourways. And so now it's a waiting game... I have the designs about ready to go. I'm just waiting on fabric and colour swatches to arrive so I can finalise them. It's a bit exciting checking the postbox each day. Hopefully I can show you the whole thing by the end of the month. I'll also go through the print process a bit more then, but I think I've raved on quite enough for one day! Anyone else been inspired by their travels to create?